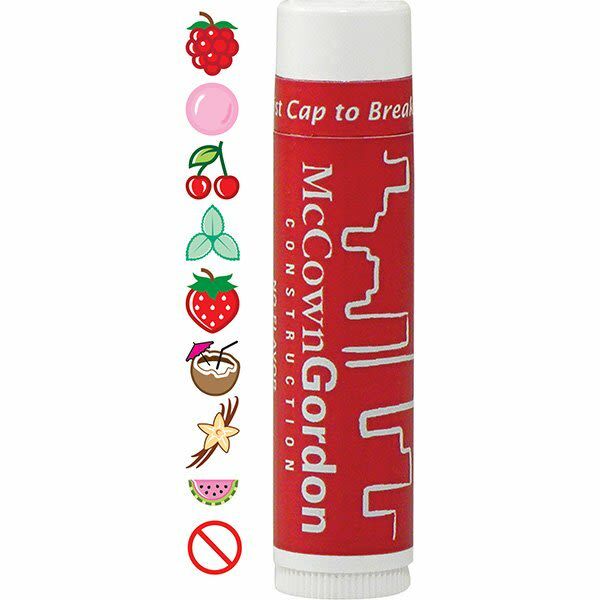 This custom SPF 15 lip balm is known for its great texture and range of flavors. It offers UVA and UVB protection to limit damage from harsh solar rays, and is PABA free. A notch above the familiar Chapstick brand, this custom lip balmand includes Aloe Vera and Vitamin E for lip health. Handout a promotional giveaway that is useful, compact, portable, and generates numerous impressions for a very low price. Your full color label will get plenty of attention. Available in a variety of great flavors, including our most popular tropical flavor, reminiscent of a tropical drink with coconut and banana flavor. Made in the U.S.A. Your price includes a full color imprint on a white label. Additional imprint styles may be available. Please call for more details.